In March 1919, the Australian government laid down a challenge. The first Australian-born crew to fly the 11,000 miles from England to their homeland in 30 days would win a prize of £10,000 (more than $1 million today). Only six teams competed in what became known as the Great Trans-Planet Air Race. Captain Ross Smith and his brother, Keith MacPherson Smith, along with their two mechanics, completed the journey with two days to spare. The second-place team needed seven months. The Smith brothers’ victory was not easily won. Their Vickers F.B.27 Vimy, the 10th of 330 Vimys built in England, was given the registration G-EAOU. Ross, partly joking, said that the letters stood for “God ’Elp All Of Us.” Little did he know when he made that quip that he and his crew might need the intervention of a higher authority, along with both skill and luck, to reach their destination. 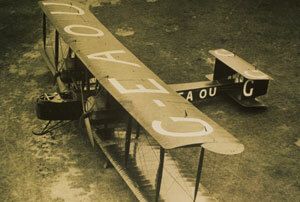 G-EAOU was built at the Vickers factory in Brooklands. Courtesy of National Geographic Society. G-EAOU departed Brooklands on November 12—six months after Alcock and Brown’s successful transatlantic flight, also in a Vickers Vimy—with Ross Smith in the pilot’s seat of the open cockpit and Keith beside him, serving as navigator. Mechanics Jim Bennett and Wally Shiers occupied the front and aft cockpits. The weather that day, classified as unfit for flying, could have been seen as an inauspicious omen. Nevertheless, the crew arrived in Lyon, France, in just under six hours. Nearly every leg of the flight after that was an adventure. G-EAOU had to be pushed out of the mud in Pisa, Italy. 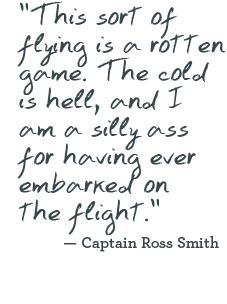 In Cairo, following a safe crossing of the Mediterranean, a crack opened up in one of the cooling water pipes and had to be sealed. More repairs followed in Iraq. The reward was a few days of fair weather and a chance to soar above the Taj Mahal. Disaster threatened in Thailand, where Ross had to land the plane in a recently cleared runway filled with tree stumps, a preview of what was to come. 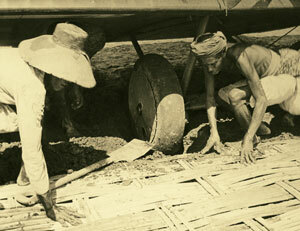 A stop in Surabaya, Java, was to be routine, but G-EAOU broke through the crusty surface of the landing site and sunk into the viscous mud. Each time the crew dug out the Vimy, it got bogged down again. The foursome thought that the race was over. Then, locals from the nearby village dismantled their huts and began to lay the bamboo and reed mats on the field. One day and many mats later, G-EAOU headed down the 1,200-foot runway on the home stretch. Around noon on December 10, as G-EAOU neared Australia, the Smith brothers spotted the Sydney, a naval ship. Ross scribbled a message, slipped it into a bottle, and floated it down on a parachute. The ship’s crew was reassured by the missive: “All’s well!” Nearly three hours later, Ross landed G-EAOU in Darwin, winning the prize along with the admiration of his countrymen. He and his brother received knighthoods for their accomplishment.